To understand why we chose the Dame, think of the subtle transformation of something dead iota something living -the transformation of inanimacy into animacy. Think of the processes concerning life from death, and death into life. Our music takes a similar path." -Brendan Perry describing the very nature of the name, Dead Gan Dance. deemed it appropriate to use a wooden ritual mask tram a tribe in New Guinea as the cover art. He saw it as the perfect visual representation of the ancient shaman concept of creating life from an inanimate abject through one's art. This is how Brendan And Lisa view their music's foie in the greater scheme of things.
" That wooden mask provided an interpretation for the term Dead Gan Dance," explains Brendan. "Though it was once part of a living tree, it became an inanimate piece ofwood. Then, only through the artistry of its creator could it once again corne to life. By placing the mask on his face, the maker could take what was once 'dead' and restore life to it. It’s interesting that this belief would crop up in many different societies. The music Dead Gan Dance produces is indeed full ofand quite inspirational. From choir-like choruses to somber dirges, their music spans the centuries. 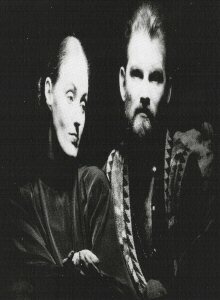 Brendan and Lisa have trained themselves in many classical styles -gregorian, medieval, chamber and baroque. They have also borrowed heavily from Celtic folk, Turkish and Teutonic tonalities. Over the past ten years, this twosome has transcended time with classic Lps as SPLEEN & IDEAL ('85), WITHIN THEREALM OF A DYING SUN ('87), THE SERPENT'S EGG ('88), andAION ('90), (ail on 4AD records). They have taken up traditional instruments like dulcimers, mandolins, violins and flutes to give their sound a uniquely authentic feel.
" Around the time we started recording for WITHIN THE REALM OF A DYING SUN in late '86," recalls Lisa, "we came to the realization that the standard band format of guitar, bass and drums wouldn't be adequate to express our musical vision. We had been learning classical theory such as baroque structures, and were no longer interested in a strictIy contemporary style of music. This required a whole new array of instrumentation backed up with synthesizers which could give us many additional sounds. By the time the next album rolled around [THE SERPENT'S EGG], we were quite proficient in the classical troubadour trouvere." Lisa, herself, seems to corne right out of the mysterious Middle Ages her wondrous music heralds. Often cloaked in flowing gowns and capes, she seems to float across the stage Lisa draw tram to create their elaborate tapestry of aurai when performing live. Her pale, waxen skin and beautiful, classically-trained voice give her an almost angelic, Raphaelesque elegance and aloofness. She seems almost unapproachable. Brendan, on the other hand, is folksy and down-to-earth. You'd think, by looking at him, that he was a simple shepherd in Ireland's green & pleasant farmlands. Which, by the way, isn't tao far tram the truth. He is presently living in an cid, converted stone church in Cavan County, Ireland. It is there that he tends a modest flock of sheep and some crops. 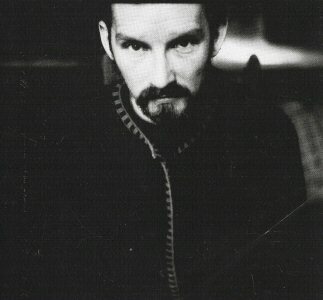 It's also where he wrote much of the material for the new Lp, INTO THE LABYRINTH. Undoubtedly, the rustic surroundings provided the proper atmosphere for Dead Gan Dance's continued journey through time and space. Lisa made we don't fit any one classification -and that cornes tram the several trips to the Cavan church to help record the album and add her own contributions to the collection of sangs. She is presently a resident of Moondarra, Australia (not far tram where she grew up) where she lives with her husband and young daughter. This news may corne as a heartbreaking shock to many long-time Dead Gan Dance fans who have corne to regard Brendan and Lisa's love for each other as an integral part of the band's aura and appeal. Sadly, their ro¬mantic relationship tell apart shortly after the release of AION in 1990. It seems that romantic love and a shared love for one's art don't always mix.
" We reached a point where we were together tao much," says Lisa. "We worked, lived, ate and slept together. We could no longer separate out personal lives tram our creative lives. So every little disagreement on a creative level be¬ came a problem on a personal level as weil. Because our re¬lationship now is based in true friendship and creative colla¬boration, I feel that our artistic output is that much stronger. With INTO THE LABYRINTH, we had so much more focus. We didn't burn out on each other. Now, it's the music itself that keeps us together, so it's the music that benefits." The new album expands the colorful palette Brendan and styles. The music is ever-growing, ever-evolving, while main¬ taining the trademark haunting Dead Gan Dance sound. Aiso growing by leaps and bounds is the sile of their audi¬ence. The recent U.S. tour was a complete sell out, and the album reach fairly significant heights on the Billboard charts¬ a first for this cuit 4AD group. transcend the everyday common world. It's through music that we pretend to be something else, somewhere else, and at some other point in time. Shouldn't entertainment offer some degree of escapism?" And thanks to Lisa and Brendan, we Gan take these little metaphysical time-trips just by giving their discs a spin. Put on "Tell Me About The Forest" and take a stroll through the enchanted woodlands of central Ireland. Put on "The Song Of The Sibyl" and visit the castles and palaces of 16th-century France. Give "Radharc" a spin and watch the crescent moon rise over the dawn skies of the Ottoman Empire. Skip over to "The End Of Words" and kneel at the altar of a 13th-cen¬tury Gothic cathedral. Finally, put on "Anywhere Out Of This World," and take a trip to anywhere out of this world. 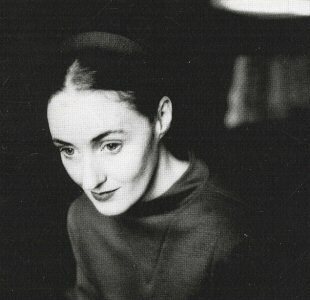 Yes, Dead Can Dance is about pretense, and they make no apolo¬gy, nor should they. For over ten years now, Lisa and Brendan (along with their assortment of backup musicians) have been creating music on their own terms, and it appears to be paying off. 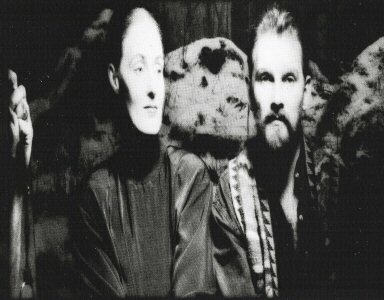 Brendan says Dead Can Dance will continue as long as he and Ms. Gerrard have the spirit moving them to do so. the next Lp. I guess it's true, you can never carve out e¬nough masks." DEAD END.